Blog and News at Acrotech Inc. Lake City MN | Acrotech Inc. Depending on the resources, time and money available to you there may be the option and advantage of making a mold in house. We have plenty of customers that choose to make molds and send them to us for us to pour our highly durable K-Prene® urethane. The foreseen advantage is complete control of the mold and overall outcome of the part being produced resulting in the potential lowered costs of engineering and manufacturing of the mold in house. Of course this can create unforeseen problems and extend the amount of time it takes to complete the mold making process if we cannot correctly pour the part or there happens to be a mistake in the mold. Because we are a urethane and mold making manufacturer we work with businesses like you, do this every day and can design molds that we know will end up working with our manufacturing processes. The idea behind having this service under one roof is to cut down on overall costs and time that it takes to complete a finished product. We are very competitive with our rates for engineering, mold making and machining as well as the urethane itself. We have a dedicated mold room to house your molds on site and only to be used for your production needs. After all of the time spent on communication, shipping and freight charges we strongly suggest you Contact Us to discuss your application with us before deciding to build molds in house. We manufacture and pour blocks of urethane for a customer that will further machine them for their particular application. This photo shows that we pour these very large blocks of 90A durometer urethane on various thicknesses of plate steel. The end user will then set them in a fixture for mill machining them as well as locate and drill all of the holes for a final product. The sky is the limit for these types of applications. Higher durometer urethane is easily machined to exacting tolerances while allowing for a final product that will be durable and forgivable for your application. You can trust Acrotech Inc. to provide you with the best and most consistent urethane in the industry. Contact Us for a quote on how this service could work for you and your business. Acrotech Inc. Supplies multiple race car teams with a little known part that helps dial in race car suspension for specific tracks and conditions. The urethane spring rubber insert. Sometimes changing out a spring in favor of height and rate can take more time than what is available. This is evident when it comes time to pit the car, when time is of the essence a simple removal or swap of a spring rubber to help dial in feel and dampening can make the difference on a podium finish or not. 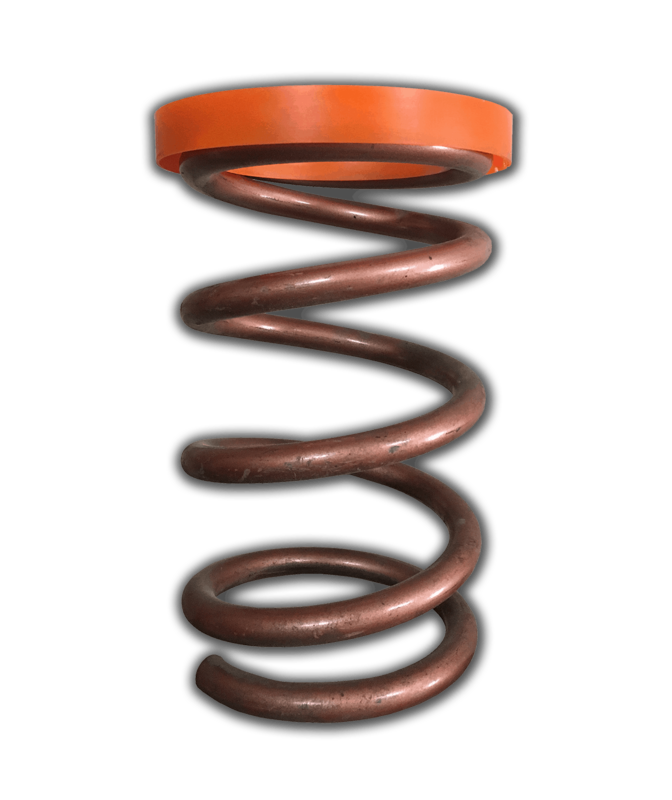 Our urethane spring rubbers are highly customizable for many common sized springs. The durometer or hardness of the urethane will increase the spring rate a little bit (40A Durometer) or a lot (95A Durometer) effectively without swapping springs. Testing or trial and error is case by case, we recommend to start with several sets in different durometers to test for your vehicle on your track. Wether it be Nascar® or your local dirt racing track. Get the edge over the competition and call us for urethane spring rubbers. Contact us for a Quote. To view more of our urethane spring rubbers and other automotive offerings please visit this link. Roller Data Form: If you have a roller that needs refinishing and know the dimensions durometer and quantity please download and fill out this form. Call or send in a quote request form with this attached and we will get back to you as soon as possible with competitive pricing. Have another type of roller? No problem. Call us at 1-800-345-0583 to discuss more details and how we can help you recover with long lasting highly durable urethane. A few older articles on thefabricator.com has come up and we are just archiving them here on our site for more exposure and future viewing. When forming complicated shapes with sheet metal we have a solution that can be custom tailored to each application. A very sound investment for running production on these types of materials and odd applications. The life expectancy of the urethane varies depending on material, pressures and use but our special formulated k-prene® is the toughest urethane in the industry. Urethane Metal Backed Sheets. Available in many different sizes, materials, thicknesses and durometers. These sheets are versatile and come in handy when preparing items for quick and fast repairs. The urethane is bonded to the metal sheet in the process of pouring and casting. The glue and urethane are both heated up in the process allowing for a strong inseparable bond. These sheets are precision cast meaning that the face is completely flat and blemish free. The uses for urethane on metal backed sheets are endless in the maintenance and industrial field as well as packaging and automation. They can even serve as a base for precision water jetting of OEM parts. Cut, drill and saw this material to suit your needs. All standard metal sheet sizing is 10GA. (.135) Mild Steel. We can bond this to thinner / thicker mild steel or aluminum. Have an exotic application or material that you need our urethane bonded to? Contact us to find out how we can help you and provide a service unlike any other in the industry. Bonding urethane to metal is something we take pride in doing and are able to help with truly custom / unheard of parts. Find out why Acrotech Inc. is the leader with urethane metal backed sheets. For those in the food industry looking to improve the production capabilities and reliability of machinery operations we highly recommend servicing parts with our food grade urethane. The unique and durable properties of urethane are excellent for use in the food industry. We are able to recover most existing parts such as rollers, mixers, paddles and more. Our entire process ensures that you get an exact part in return that its defect free for long and reliable use. Wash down and clean up is a breeze with our urethane. The various durometers or hardness of the material can fine tune your operation to run at maximum capacity. We are here to help you every step of the way from product conception, engineering, mold making and production pouring of your parts. If you have any questions or need help please Contact Us. We have a Roller Recovery Video up on YouTube! Check this video out if you are in consideration for refurbishing your worn out rollers. We are able to handle most types and sizes of rollers and refinish them according to your specifications. A lot of rollers that are OEM tend to be made with sub-par materials and tend to deteriorate over a short period of time. Our rollers are refurbished with highly durable and long lasting urethane that can be specified in softness/hardness and machined to exacting specifications. Depending on your application, urethane will last many times longer than traditional materials. We are able to machine the finish of the rollers according to your needs. Multiple types of grooves or patterns can be machined to help with feeding properties of rollers material handling. Color has no effect on performance and is a personal choice, custom colors are available upon request. If you feel you can benefit from our roller recovery service please don’t hesitate to Contact Us We will be happy to talk with you about your application, cost and lead time.